Kogi state governor Alhaji Yahaya Bello has apologized to Catholic Bishops in Nigeria over a statement credited to him in the media. Nigerian Tribune reports that the Governor, who spoke through his director general of media and publicity Kingsley Fanwo, said in Lokoja, the state capital he never disrespected the Catholic Church and her leaders. According to him, his words were misrepresented by the media but he will still take responsibility and apologize. He said: “My statements to the Press were misconstrued and misrepresented but I take full responsibility for this as I tender my unreserved apologies to the Catholic Bishops and by extension my Christian brothers and sisters who are displeased with my statement on tithing. “I recognise the enormous contributions of the Catholic Church to entrenching a social order which is devoid of corruption, oppression and in the promotion of socio-economic justice." Bello saluted the Catholic church for its contributions to the society and said he was confident genuine religious leaders of all faiths are united in President Muhammadu Buhari’s fight against corruption. 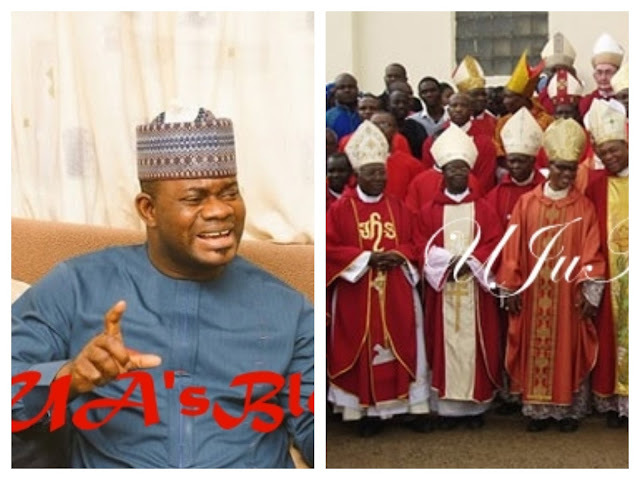 Earlier, We had reported that Governor Bello came under fire for his comments about the visit of Catholic bishops to President Buhari. Christian Association of Nigeria, prominent Catholic bishops and some Catholic groups have slammed the governor for his comments which they found unfair and out of context. Leading the critics is Catholic Bishop of Sokoto Diocese Bishop Matthew Hassan Kukah who felt the statement was uncalled for.